John R. Kretzschmar peacefully passed from life to Life on October 17, 2018 after a short illness. He was born on June 11, 1933 in St. Joseph, MO. John graduated from the University of Missouri at Columbia, MO with a Bachelor’s of Science degree in Chemical Engineering. It was there that John met his future wife, Suzanne (Zander). John’s professional career started with Spencer Chemical Company. He took a brief leave from Spencer to complete his ROTC commitment in the USAF, eventually becoming a Captain. After becoming a nationally recognized salesman in the plastics industry, John used his considerable talents as a salesman to found Blako Industries in 1970. He led this company, a flexible film extrusion plant, located in Dunbridge, OH, until he sold it in 1996 to a group of employees. John held many professional leadership roles, including President of the Society of Plastics Engineers, President of the Plastics Pioneers Association, and Chairman of the Plastics Academy. John was inducted in the Society of Plastics Engineers Hall of Fame in 2003. John’s faith in God led him in all areas of his life. 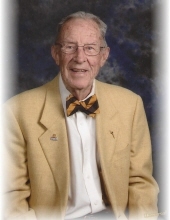 As a member of St. Mark’s Lutheran Church in Bowling Green, Ohio, for 48 years, he was Church Council President on two occasions, taught Sunday School for many years, and was an early service usher for decades. As a member of the Bowling Green community since 1970, John was involved with Junto, BGSU’s Phi Gamma Fraternity, and BGSU’s golf team. Starting in 1964, John volunteered to work at thousands of amateur and professional golf tournaments. These efforts were recognized by his induction the Ohio Golf Hall of Fame and Toledo District Golf Association’s Hall of Fame. The Chick Evans Scholar Foundation, a special passion for John, provides to golf caddies, challenged by financial and/or family circumstances, tuition and housing scholarships at 4-year institutions. He chaired the WGA Junior Golf Championship for 14 consecutive years, raised tens of thousands of dollars for caddie scholarships, mentored caddies and volunteers, and co-chaired the capital campaign to build the $40,000,000 Evans’ Scholar House at Ohio State University. John was awarded the WGA/ESF’ prestigious Lifetime Achievement Award in 2017. John was devoted to his wife, Suzanne, who preceded him in death on December 30, 2017. He is survived by their two children, Brian R. Kretzschmar (Bowling Green, OH) and Leigh A. Kretzschmar (San Diego, CA). John was very close to his five younger brothers, all of whom considered John as their mentor. All five brothers, Jerry (Naples, FL), Mark (Columbia, MO), David (Belton, MO), Richard (Virginia Beach, VA) and Victor (Hemple, MO), survive him, as well as his grandchildren. John’s Celebration of Life service will be held on Saturday December 15, 2018 at 10:00 a.m. at St. Mark’s Lutheran Church, 315 S. College Dr. Bowling Green, Ohio 43402. Visitation will be held that morning at the church from 9:00 a.m. until the time of the service at 10:00 a.m. Bow ties are encouraged and appreciated! Funeral arrangements have been entrusted to Dunn Funeral Home in Bowling Green. He would be honored with memorials contributed to the Evans Scholar Foundation (www.wgaesf.org) or St. Mark’s Lutheran Church (Bowling Green, OH). To send flowers or a remembrance gift to the family of John R. Kretzschmar, please visit our Tribute Store. "Email Address" would like to share the life celebration of John R. Kretzschmar. Click on the "link" to go to share a favorite memory or leave a condolence message for the family.